It is a significant finding that the office of the State Attorney General (SAG) which I will henceforth call the SAG Syndicate – has 113 attorneys that are embedded in our state government. The failure of the SAG Syndicate to uphold their oaths of office and their oaths as officers of the court to support and defend the Idaho State and U.S. Constitutions is prima facie evidence that the state government of Idaho has been commandeered from the inside and the agents of change within SAG are in rebellion against the Constitution and the American form of government. By all outward appearances, there is nothing untoward about the Idaho Attorney General’s office beyond the grossly excessive number of attorneys and their assignments embedded within the departments of state government. But in the historical context of the last decade of the twentieth century and the first decade of the twenty-first century, it’s like catching the thief in the act. What are they stealing? They are stealing America’s sovereignty as an independent nation state. It appears that our country has been captured by World Federalists – Communists to be precise. That’s what George H.W Bush’s New World Order was about. The capture has not been done with soldiers. It’s been accomplished through propaganda, bribery and corruption, international agreements to integrate law and systems of government systems across international borders. The International Child Support Enforcement System is just one of many – but it was an important one from the standpoint of forcing (even if by pretense) the states to vote to participate. It was treason by consent – participation in a treaty contrary to one of the most clearly stated provisions in the Constitution – Article 1, Section 10. It’s difficult to choose a beginning point because the World Federalists worked towards building a one-world, international federalist system of government for the entire twentieth century but a good place to start may be President Ronald Reagan’s 1982 trip to Europe. His first stop was to speak to the British Parliament. Essentially, Reagan’s purpose was to accept Brezhnev’s challenge of a battle of ideas and systems to end the Cold War. What Reagan agreed to were cooperative exchanges under the provisions of the Helsinki Final Act signed by Gerald Ford in 1975. The exchanges were of people engaged in Scientific, Technical, Educational and Cultural professions. The 1985 Agreement and the 1988 Program of Cooperation and Exchange were the predicate actions to the fall of the Berlin Wall and the end of the Cold War between the nation states of the east and west. It wasn’t the end of Communism. It was the beginning of redefining the battlefield to civilian turf for the Battle of Ideas and Systems in America. S.1067 serves as evidence that the Communists are winning – for the moment. In 1990 when the Berlin Wall came down Mikhail Gorbachev was welcomed in this country as if he was a long lost returning hero. History was erased. Communism was dead. The New World Order was born. At the G7/G8 Summit in Houston, Texas, world leaders agreed to “reduce the structural rigidity” of North America (i.e. create a North American Common market – NAFTA) and to create an open world system of trade under international law (i.e. World Trade Organization – WTO). Also in 1990, technology industry CEOs approached the government with a technology vision. They called the organization the Computer Systems Policy Project (CSPP). A side note of interest for Idahoans is that the founder of the CSPP, John A. Young was a native Idahoan, born in Nampa Idaho. He was CEO of Hewlett-Packard at the time of the founding of CSPP. The Technology Vision of CSPP became U.S. policy. Some of the projects for the “reinvention of government” actually began in 1990. Bill Clinton and Al Gore picked up the mantle and ran with it following the 1992 defeat of George H.W. Bush. As you can see from the Health Care Vision on the above captured webpage, the CEOs were marketing technology to the government as if there were no other considerations for government other than to make it a lean and mean corporate machine. In other words, a fascist corporate construction of government and in fact, that’s exactly what the “reinvention of government” project actually did. It transformed the American government into a fascist bureaucracy. The end of the Cold War and with the adoption of the CSPP technology vision, it caused the United States to redefine national security policy as one of “risk management”. The following are a few excerpts from a Department of State history during the period from 1992-2000. The titled of this chapter of the history is A Blueprint for Security. Amid the new post-Cold War world, a movement to “reinvent government” emerged, and Assistant Secretary Quainton and Under Secretary of State for Management Richard Moose sought to make DS a “laboratory” for the movement. Headed by Vice President Albert “Al” Gore, Jr., “Reinventing Government” sought to reduce archaic rules, excessive layers of bureaucracy, and wasteful spending on duplicate efforts in several agencies. …“reinventing” DS meant embracing the “risk management” approach more fully (as opposed to risk avoidance) by developing security standards based on threat levels and applying countermeasures in a cost-effective manner based on a post’s threat classification. Reinventing DS also included reclassifying many positions to a lower security clearance, eliminating research and development in technical security, and reducing the Secretary’s detail, the number of local guards at posts, and the Diplomatic Security Guard program. It was the change in the philosophy of security policy across the entire government to meet the conditions of open borders for international trade and the movement of people combined with the technology revolution in government based on the assumption that a redesigned government for the 21st century could save money by replacing the human factors in security that caused a paradigm shift in organization and strategy. Following the bombing of the Murrah Building in Oklahoma City, the government circled the wagons and government policy became “us and them” with citizens being “them” and police state data collection, surveillance and control became the solution. The technological solution for a government fearing domestic terrorism was the fusion center concept for the technologically-based police state. 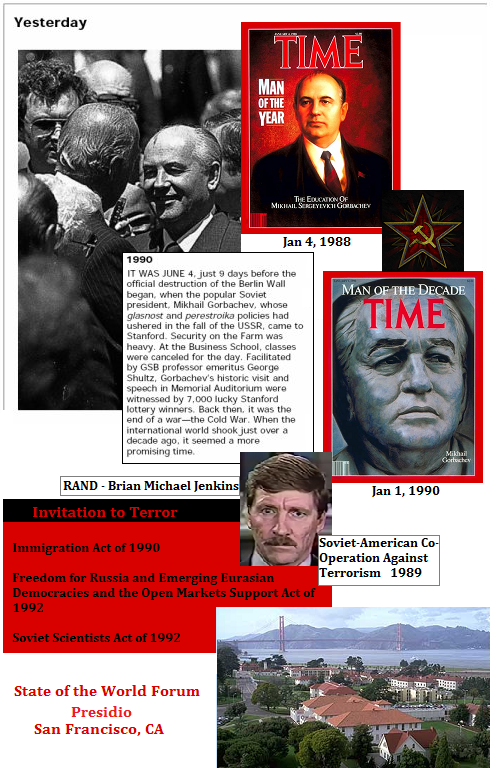 Since the design of this was done under the cover of national security with all citizens and people in the country as potential terrorists, and with the mission and purpose of the fusion centers being contrary to every American principle upon which this country was founded and enshrined in the U.S. Constitution, the strategy required to implement government systems including the fusions centers was consolidation of the instruments of law enforcement all the way up the chain to the courts. The soldiers in this war on “domestic terrorists” are the lawyers who have been embedded in our state governments to serve the bureaucracies in the implementation of unconstitutional and illegal acts of the 21st technologically-driven, redesigned system of “governance”. The only way I can make it clearer is to simply say, the lawyers who should be the defenders of legitimate, constitutional government have become the defenders of the criminality of the police state and the treason of participating in the integrated systems of the one-world government bureaucracies that are engaged in building an international system of government. That is the SAG Syndicate paradox. It is what it is. The pretense and invincible ignorance on the part of our elected “leaders” doesn’t change it. It would be advisable for them to remember that every dog has his day and our day is coming. The ultimate delicious irony and poetic justice would be to see them all on trial at the international criminal court at The Hague.